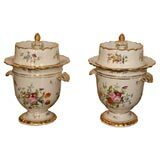 Two wonderful and rare Old Paris porcelain hand painted baskets, France, 1840-1850 Hand painted with flowers an gold decorations. Good condition. Small restauration on the underside of one of the baskets, not visible when on display. 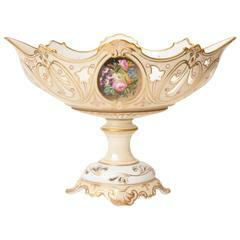 Measures: Diameter 23cm, height 18cm. Good condition. Small restauration on the underside&nbsp;of one of the baskets, not visible when on display. France, 1850-1880. Porcelain and hand-painted with bouquet of flowers. Good condition. Minor fritting on two dishes on the bottom. Measures: 22cm x 25cm. 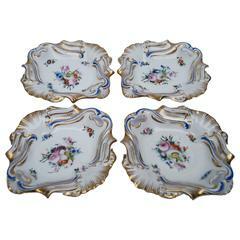 This set of four porcelain plates are hand-painted, featuring bouquets of flowers. They date from the period 1850-1880 in Old Paris or Vieux Paris style. Price for both items. Pair of antique French old Paris hand-painted vases Jacob Petit marks. 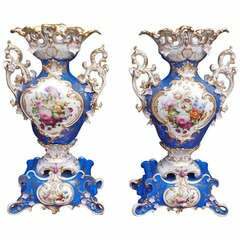 A pair of antique French porcelain Old Paris spill vases feature floral form with hand painted and gilt floral and foliate decoration, circa 1880. 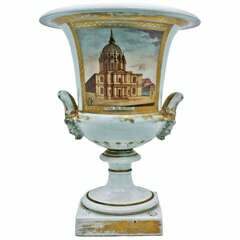 Measure: 9" H x 8" W x 4" D.
Pair of French Old Paris vases with painted, gilt, and figural floral decorative scenes.